Video camera view, night vision, area of cult mass die-off. Strapped inside Writer-Director Philip Gelatt’s 101-minute feature, which opened to mix reviews Friday, March 2, in New York City, is a gem cocked and ready to shake-rattle-and-row the bejesus out of audiences. It’s imperceptible cinematic existence becomes evident in the riveting visual and audio panache of the final minutes of the film. Gelatt should re-release a reconstituted THEY REMAIN, maybe even call it THEY REMAIN (RECONSTITUTED), and it should be minus 30 to 45 minutes of Cinematographer Sean Kirby’s lush landscaping. Why? Kirby’s luxuriant landscape scenes where a horrific cult die-off, kill-off took place – sometimes you can’t tell the the motive – kept this reviewer from from being lulled into state of narcoleptic cinematic inattention, though his mind did wonder at times. I watched and watched and watched, WAITING FOR SOMETHING TO HAPPEN, and something was happening but it didn’t capture my attention while the cinematography of the lush landscape kept my eyes fixed. I did experience an eerie, subliminal twinge that something apocalyptic was at work. That sensation crept into my awareness in the middle of the story. I can’t wait for THEY REMAINED – fingers crossed – to show up on cable so I can fast-forward through scenes I think slow down the narrative too much. Nevertheless, I have to shout out: Attention Philip Gelatt, edit out 30 to 45 minutes and audiences will be squirming and fidgeting and leaping out of their seats as this reviewer did. 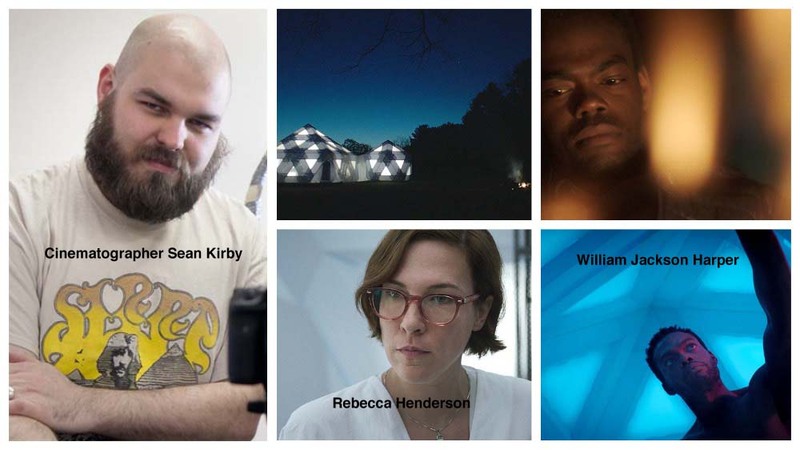 THEY REMAIN explores the evolving relationship between Keith (William Jackson Harper) and Jessica (Rebecca Henderson), two scientists who are employed by a vast, impersonal corporation to investigate an unspeakable horror that took place at the remote encampment of a mysterious cult, according to a publicity blurb, which stood out for this reviewer. I have been primed for years by a steady diet of unspeakable horrors taking place in real time and in the real world, from mass murders at schools (I blame the NRA) to night clubs (I blame the NRA) to outdoor concerts (I blame the NRA). And, of course, there’s the murderous mayhem in Chicago and the nationally occurring onslaught of police shootings of innocent and unarmed individuals, too many People of Color. And don’t get me started about the murderous collateral damage occurring in those war overseas and areas where international crimes against humanity occur. I am ready for unspeakable horrors. Real or unreal. This one, however, caught me off guard. I was not impressed with the so-called “evolving relationship.” It was so nuanced and diffused and so overpowered by scenes of lush landscaping that many audiences may experience narcoleptic moments when their minds are wondering off here and there. Keith and Jessica were real nerds. Keith had more passion for the numerous action-cameras he had set up to document possible events and incidents. Jessica’s passion was conferred on the analysis she was conducting in the lab inside of the tent-like structure that served as their base. Nerds, they were. Their conversations contained subtle taunts, and I never sensed that they were making a connection when they were, supposedly, talking to each others about moments in their lives and careers, but I mostly got the impression that they were talking more to themselves.. When they finally got it on, I wondered what was the incentive. It sure wasn’t lust. Working and living in a state-of-the-art high tech environment that is completely at odds with their surroundings, goes the publicity, they spend their days gathering physical evidence, analyzing it, and reporting on their findings. The tedium of their routines and their banal conversations about this or that were boring, purposefully, I thought and that intent could work better, I also thought, with a more tightly edited film. I didn’t appreciate the co-stars’ solid performances until the end. The intensity of their work, and their extreme isolation, bring the pair closer. But, when Jessica discovers a mysterious artifact of unknown origin, the dynamic between them changes: Secrets are kept, sexual tensions arise and paranoia sets in. Keith begins to have visions and is unable to distinguish whether they are nightmares or hauntings. Having lost all sense of what is real and what is imagined, all he knows is that the horror he and Jessica have been sent to uncover – a horror that could be biological, psychological, or supernatural — now threatens his very survival. Or so he thought. Starring: William Jackson Harper (PATTERSON, TRUE STORY) and Rebecca Henderson (MISTRESS AMERICA). Opened in New York’s Village East Cinema Friday, March 2 and opens March 9, this Friday, at Los Angeles’ Laemmle Music Hall with a national release to follow. Gelatt’s acclaimed debut feature, THE BLEEDING HOUSE, premiered at the 2011 Tribeca Film Festival. He combines multi-disciplinary experience as a graphic novelist and comic book creator for the Indiana Jones franchise, and for such companies as Dark Horse Comics and Oni Press, with his background as a video game writer for such companies as Crystal Dynamics and Frictional Games, and on “Rise of The Tomb Raider” (for which he won the WGA Award). Movie is based on a novella by Laird Barron whose novels, short fiction, and poems have earned him a substantial following among aficionados of fantasy, noir, horror, and sci-fi, and have twice won him the Shirley Jackson Award. Cinematographer Sean Kirby’s credits include the documentaries RACING EXTENSION and THE TILLMAN STORY as well as Robinson Devor’s notorious ZOO, which created a sensation at both Sundance and Cannes.